Ginza is known as the most fashionable district of Japan’s capital, Tokyo, and one public elementary school located there recently decided that it would be very fitting for children to dress accordingly. Thus Taimei Elementary School students will be donning $700 designer uniforms created by Italian fashion label Armani. The school’s decision to replace its old uniforms without even consulting the parents has sparked outrage all over Japan, and was even discussed in Japan’s Parliament last week, with one opposition lawmaker noting that the 80,000 yen ($700) school uniforms were more expensive than most business suits. 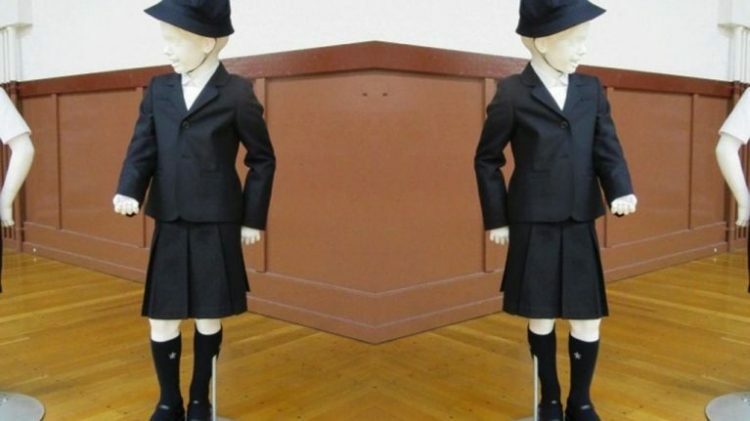 In a country where school tuition fees are already a heavy burden for most parents, Taimei’s decision to introduce luxury uniforms that cost almost three times as the old ones has been branded as unnecessary and elitist. A standard school uniform at Taimei Elementary School costs around 17,000 yen ($155) for boys and 19,000 yen for girls, and includes a jacket, pants or skirt, shirt or blouse, and hat. However, the new Armani attire would cost over 40,000 yen ($310), and also comes with optional designer accessories (school bag, vest, sweater and socks) for a total cost of 80,000 yen ($736). Parents learned about the designer uniforms in November of last year, when Taimei’s Principal Toshitsugu Wada sent out a letter to the school community, explaining that his decision was meant meant to solidify the school’s identity as a “Ginza landmark”. Many parents responded with emails to the local education board, complaining about the excessive cost of the new designer uniform, and the embarrassment brought to families that can’t afford to buy it. It should be noted that according to Ginza’s education board, school uniforms are not compulsory. However, wearing them is deemed “desirable”, and currently virtually all students wear them. Thus, many have criticized Principal Wada’s decision to opt for such an expensive option, with some claiming it was like “saying no to poor people” or that only children who take “pride in Armani” are welcome. Despite all this controversy regarding his decision, Taimei’s Toshitsugu Wada told Japanese news agencies that he feels he made the right choice and that everyone will see that the new uniforms are worth the extra cost Asked if there was any chance of scrapping the new Armani uniforms and sticking with the standard ones, Wada said that the old uniforms are no longer being produced. The new Armani uniforms are scheduled to be introduced at Taimei Elementary School in April.